Unlike most beetles, giraffe weevils have long necks. This unique species has many other interesting characteristics to learn about, too! Giraffe weevils live among the rainforests of Madagascar. Here, they eat leaves, seeds, and plants to survive. 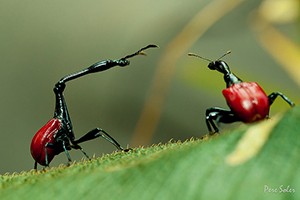 One of the most fascinating aspects of the giraffe weevil is its reproductive process. The female, who has a shorter neck than the male, rolls a leaf around her neck to form a tube. In this tube, she lays her eggs. When the larva hatches, they eat the leaf. Ultimately, they shed their outer skeleton and emerge from their cocoon with new wings and legs. Giraffe weevils have varying lifespans. Some live for years, while others only live for days. I think it would be so cool to see on of these long-necked beetles in action!